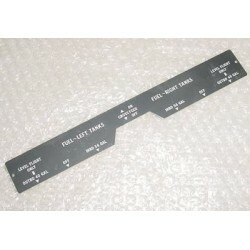 New, nos, Twin Piper Aircraft Instrument Panel Placard. P/N 581-209 or 581 209 or 581209 or 41350. 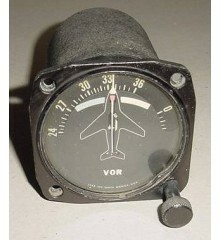 3 1/8" VOR/LOC Nav Converter / Indicator. Manufactured by Motorola. Model 550. P/N 1U028-01. It is a nonworking indicator (knob turns without engaging). Sold for display only, as is, no returns. Cessna / ARC Avionics ADF Control Panel. Model C-846A. P/N 40220-1005. It is a non-working selector panel and is sold for display only or for parts. Sold as is, no returns. 3 1/8" Cessna, Piper, Beech Electric Tachometer. 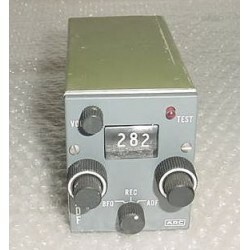 Manufactured by B & D Instruments. P/N 0514-003. It is a non-working tachometer. It appears that the mounting ring area may have been exposed to heat or some chemical (see photo). Sold for display only, as is, no returns..
Grumman American AA-1 Yankee Control Wheel / Yoke. Yoke is in average condition but can use some powder coating. Shaft is in good condition. 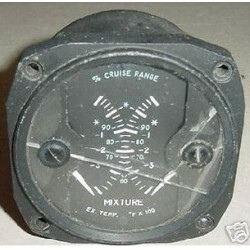 3 1/8" Twin Engine 2 in 1 Exhaust Temp / Mixture Control Indicator. Manufactured by Alcor. Very clean item. It was removed from a salvage aircraft. Glass is cracked. No probes or sensors included with indicator. Only what you see on photo comes with it. Sold as is, no returns. 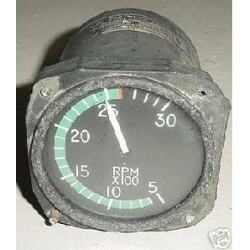 3 1/8" Twin Engine 2 in 1 Exhaust Temp / Mixture Control Indicator. Manufactured by Alcor. Very clean item. It was removed from a salvage aircraft. Glass is cracked. No probes or sensors included with indicator. Only what you see on photo comes with it. Sold as is, no returns. ..
Twin Engine Cessna Aircraft Audio Panel. Condition, as removed. 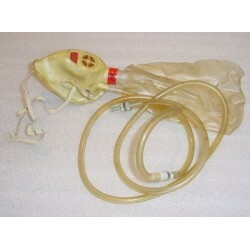 Vintage Aircraft Pilot / Copilot Oxygen Mask as shown on photo. Manufactured by Scott. P/N Z1-353016-5 . It was removed from a salvage aircraft. Sold for display only, as is, no returns. Vintage Aircraft Pilot / Copilot Oxygen Mask as shown on photo. Manufactured by Scott. P/N Z1-353016-5 . It was removed from a salvage aircraft. Sold for display only, as is, no returns. ..